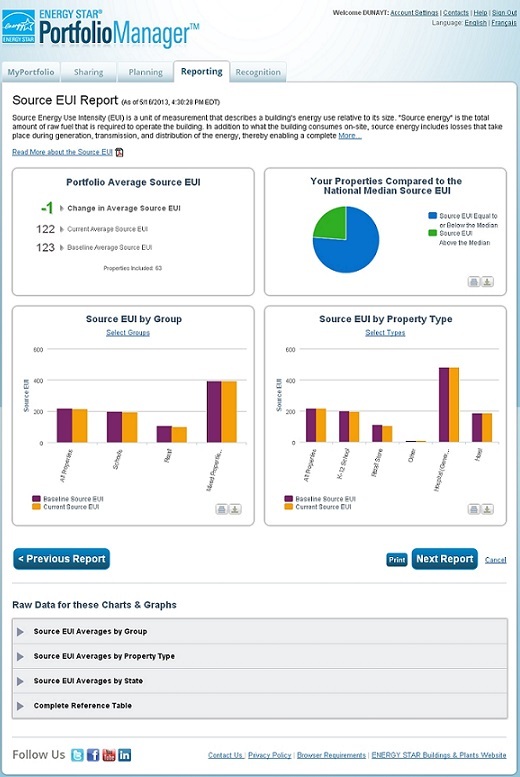 Portfolio Manager is an interactive resource management tool that enables you to track and assess energy and water use across your entire portfolio of buildings … all in a secure online environment. More importantly, it can help you implement every step of your energy management program, from setting a baseline and identifying which buildings to target to setting goals and tracking improvements. It’s also the tool for getting recognition from EPA for your efforts. Use it to help you save energy, save money … and protect the environment. You can use Portfolio Manager to manage the energy and water consumption of any building. Simply enter your consumption data, cost information, and operational use details. Portfolio Manager will then help you track more than 100 different metrics. Use them to compare your building’s performance against a yearly baseline, national medians, or similar buildings in your portfolio. Already use a system? With Portfolio Manager’s web services, you can easily integrate Portfolio Manager’s metrics into your own tracking systems or commercial energy management services. Many buildings can also receive a 1 – 100 ENERGY STAR score. This score compares your building’s energy performance to similar buildings nationwide. A score of 50 represents median energy performance, while a score of 75 means your building performs better than 75 percent of all similar buildings nationwide — and may be eligible for ENERGY STAR certification. Learn more about how the 1 – 100 ENERGY STAR score is calculated. The new EPA 1 – 100 water score is available for existing multifamily properties with 20 or more units. Just like the ENERGY STAR 1 – 100 score, the water score provides a statistical evaluation of the whole property water use—including both indoor and outdoor use—normalized for weather and operation. Use it to help identify properties in your portfolio to target for improvements and find out how your properties compares to similar properties nationwide. Learn more about how to generate the EPA 1 – 100 water score for multifamily buildings. Portfolio Manager calculates your building's greenhouse gas emissions from energy use. You can also use the tool to track avoided emissions from green power purchases or onsite renewable energy installations. Find out how Portfolio Manager calculates greenhouse gas emissions. The built-in financial tool within Portfolio Manager allows you to compare cost savings across buildings in your portfolio. By being able to quickly and clearly get figures that show cumulative investments in facility upgrades or annual energy costs, you’ll be better informed to make strategic decisions about how to manage your buildings nationwide. Want to let management know how you’re doing or participate in a competition? Need to comply with local benchmarking or disclosure laws? Use Portfolio Manager to share your performance data with others. You can also run custom reports to get insights on your performance. Portfolio Manager is also the portal for applying for recognition from ENERGY STAR. Use it to apply for ENERGY STAR certification or generate reports to apply for an ENERGY STAR Partner of the Year Award.